In 2004, me and some other guys played hockey in a wheelchair for fun while practicing for another type of wheelchair hockey, called el-hockey (this sport is only played with T-sticks). We learned that Powerchair Hockey was a sport and we had a team in Copenhagen and a national team. We tried it out and found out that it was really fun, so me and some of the other guys ended up playing in the World Cup in 2004. From there on, I was hooked and began to focus more on Powerchair Hockey than el-hockey. I like the speed and flexibility. With handheld players you can play the ball around a lot faster. They also make the games more unpredictable and you don’t need to be the strongest player. More often than not, a technical player can beat another player 1 on 1, even if he is weaker than the opponent. I also like that the T-stick can be a very important player as well. 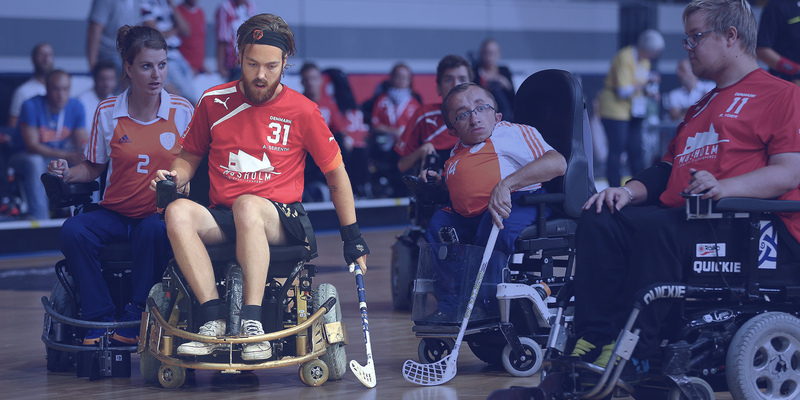 Most players of the Danish national team have played el-hockey, so we know how much you can do with a T-stick. And for us, a good T-stick can make or break a team. My position in el-hockey is actually a goalkeeper and I have won the award for best player playing in that position. I think that the classification and point system has had some problems for a long time. It has made the game a bit more focused on driving and blocking instead of passing. If you look at the old games like the World Cup in 2010, the ball was being played a lot more around and that made the game a lot faster and, in my opinion, more fun. But I also know that it’s something that IPCH is looking at and from what I have seen and heard, I think that we are moving in the right direction. I have a favorite player but not because he is one of my national team’s coaches. It’s because of his skills and personality. My favorite player Is Berrie Hommel. He has been the best technical player I have played with or against. He also plays with a big smile and for the love of the game and can still beat most players in his old slow normal chair. I’ve already had a lot of great Powerchair Hockey moments, but if I have to choose, it’s probably my time playing in the Dutch league, getting on the Dream Team last year at the Flanders Cup or winning the Prague Cup. I can’t really decide. My funniest moments happened when I lost my wheel in a couple of games. It wasn’t so funny at the moment itself because it always happened in the middle of games, but afterwards it’s kind of funny to look back at. That is one of the reasons why you’ll always see my chair have protection on the sides. My biggest goal is to win a medal with the Danish team at the World Cup. No Replies to "INTERVIEW | ANDERS BERENTH"